Gone are the hot days of summer, but the fall season reminds us that it is time to prepare for the coming cold season. Even those of us growing indoors need to begin planning for the changing weather if we grow under lights. A large number of hobbyists move plants outside once spring takes hold each year, but it is now time to begin moving them back to their winter growing area. Not all orchids need to come inside right away. Phals can be left outside until night temperatures drop below 55 F as long as day temperatures are moderate. Moving phals inside before they receive a week or so where the difference between night and day temperatures are at least 15 degrees F can delay the initiation of spikes. Once spikes emerge, it is a good idea to move them inside and away from pests that love those tasty flower spikes. Vandaceous orchids are usually considered the most cold-intolerant, but that is not universal. 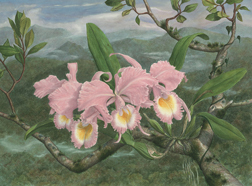 Neofinitia hybrids are often part of hobby collections, especially where there is limited space. They can survive considerable cold since the natural habitat of the parent is on the cold side. Many vandas and ascocendas with Vanda coerulea in the background bloom with brighter color if they are experiencing cool nights. Ideally, however, most strap-leaved vandas don’t like it when day temperatures drop below 80 degrees F and nights are below 60 F.
Cattleyas are surprisingly tolerant of cool nights and flower better with brighter colors when nights are cool and days warm. The most tolerant orchids for cold are Cymbidiums and most flower best when exposed to near frosting temperatures. Once spikes emerge, it is best to avoid extreme cold, but this group of orchids is cold tolerant. Once spikes begin to form buds there is a risk of bud blast, so move Cymbidiums into warmer areas. Of course, there are many kinds of orchids with all sorts of requirements during this transitional season. If there are plants in your collection that do not bloom or bloom poorly, but grow well there may be special conditions you need to provide. If the non-blooming orchid is a species, there are likely books that can tell you what you need to do to get it to bloom. Hybrids are usually easier to bloom, but often require conditions similar to species in their background. If you grow in a greenhouse it is time to check heaters and vents to be sure they are working properly. The first cold usually comes when you have the least time to get ready so do it now. Not only are you planning for cold, but so are many of the pests that cause problems in winter. If you have your orchids outside and plan to move them in, you need to avoid bringing these pests inside too. Dipping orchids in your preferred pesticide, pot and all, is a way to get rid of pests hiding in pots. For me, large roaches are a real problem that plagues me all year long here in Florida. An old friend introduced me to a new product that seems to be working well. The product is Niban Granular Bait which has orthoboric acid as its active ingredient. So far, I have not put it in pots, but on benches alongside pots. There was no sign that it was working at first, but soon large roaches started appearing dead on the greenhouse floor. In addition, there is now little damage to new roots and flower buds. Hopefully, this will continue when the greenhouse is closed in winter.